Ryan Cayabyab: Bio & Choral Music | Santa Barbara Music Publishing, Inc.
Ryan Cayabyab (b. 1954 in the Phillipines ) graduated from the University of the Philippines College of Music with a bachelor’s degree in music composition and went on to teach music theory and composition there for almost two decades. At home with any genre, Cayabyab excels as a composer of the eclectic, the modern, and popular music. Awarded in 1978 as one of TOYM (Ten Outstanding Young Men) of the Philippines, in 2001 he emerged as the only Asian winner of the Onassis International Cultural Competition in Greece with his MISA 2000. His musical output consists of several masses, award winning film and television scores, short symphonic works, ten full-length Filipino musicals, a major opera, full length ballets, solo and instrumental works, orchestrations of Filipino folk, popular and love songs, three one-man (he provided all 16 voices) a cappella song albums, and scores of popular songs sung by top Filipino recording artists. In addition to winning several international music festival competitions, he has won countless awards from the film, television and recording industries. Ryan and his wife Emmy run the Music School of Ryan Cayabyab, now on its twenty-second year. 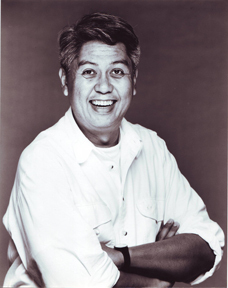 Ryan Cayabyab has 2 titles published with Santa Barbara.